I'm always on the lookout for vegan/vegetarian protein recipes that are bento friendly, and this flat oven baked loaf is another one. It's called triple-soy because it has tofu, edamame and miso in it. It has a very dense, rich texture with a sweet-salty glaze. One or two small squares are quite enough for a bento. It may fall apart a bit during transport, but that doesn't affect the texture or flavor. If you can, put it in its own compartment in your bento. This is adapted quite a lot from a recipe in one of Yumiko Kano's vegan cookbooks. Her recipe used a lot of very Japanese ingredients that may be difficult to get a hold of outside of Japan. So I've experimented and used a lot of more universally available substitions. The only ingredient that you may not have on hand is kuzu or kudzu powder (more about kuzu here), but it's such a great thickening ingredient that it's worth having on hand. Kuzu is superior to cornstarch, flour and so on since sauces thickened with it stay clear and thick even after cooling. But if you can't get kuzu, just use cornstarch or potato starch instead. (Added April 18, 2013: I have revised this recipe to make it even simpler than it was previously. It's gluten free as long as you you use gluten free versions of miso and soy sauce. A food processor of mixer is suggested for making this dish. 1 tablespoon white miso, or whatever miso you have on hand; use a gluten-free miso if you are gluten sensitive. Press the water out of the tofu by wrapping it in paper towels and placing it under a weight like a plate or a cutting board and leaving for about 15 minutes. Draining off the tofu well is very important - it should weigh half of its starting weight after you're done pressing it. Preheat the oven to 200° C / 400° F. Line a baking sheet with parchment paper or a silicon baking pad like Silpat. To shell frozen edamame, pour some boiling water over then and drain; pop out the beans inside. You will probably need about 2 1/2 - 3 cups of whole edamame for 1 cup of shelled. Alternatively use frozen and defrosted pre-shelled edamame green peas. Add the edamame and pulse until the edamame is chopped up but not totally mashed. If it seems too runny or moist, add 1 more tablespoon of potato starch or cornstarch. Form the mix into a flat loaf (about 25cm / 8 inches or so square) on the lined baking sheet. Smooth the surface with a spatula or your hands and a little oil. Bake for 20-25 minutes, until very lightly browned on top and a bit firm. While it bakes, make the glaze. Mix all the glaze ingredients together in a small pan until the kuzu is dissolved. Heat the pan over low-medium heat, mixing all the time, until the mixture becomes smooth and clear and thick. 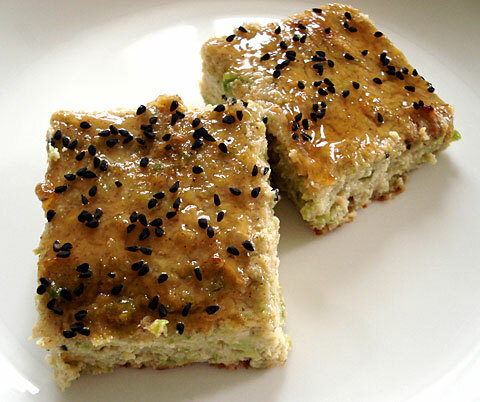 Spread the glaze over the warm loaf, and scatter with sesame seeds or kalongi (nigella) seeds or poppy seeds (optional). Let cool completely, and cut into 9 squares (or smaller if you prefer). Spread the glaze over the warm loaf, and scatter with sesame seeds or poppy seeds (optional). Let cool completely, and cut into 9 squares, or whatever size you prefer. This freezes well. To defrost, put into a very lightly oiled frying pan over medium-low heat, cover the pan and let steam-cook. You can also bring it frozen - it will defrost nicely by lunchtime. To make this gluten-free, use gluten-free breadcrumbs and 2 Tbs. desiccated potato instead of the flour. To make this spicy, use gochujang (kochujang) instead of miso. If you don't have edamame, or don't want to bother with shelling them, use frozen green peas. Instead of baking as a loaf, make small patties with oiled hands and fry them in a frying pan. The loaf is very interesting as a sandwich filling, or spread on crackers. Hello, Wonderful site you run. I’ve just found it and am really impressed. Hope this isn’t taken as some kind of advertisement. I just recently discovered an internet store that sells some pretty nifty japanese bento boxes and ships worldwide. I was impressed by the service so thought I’d pass it on. It’s run by a Mr Yuji Hirai out of Chiba and delivers world-wide. I have ordered a couple of times from Nagomi and they are very good indeed, with great communication (unlike some other eBay bento sellers). Thu, 2008-07-24 02:40 by a.s.p. Thanks for posting this recipe. I made it for dinner tonight and it was great! My boyfriend will be taking some leftovers in his bento tomorrow. I wanted to work up a calories and fat note for this before i print it out and put it in my recipe binder and I could have missed it but how many servings does this make? Tofu in package normally has about 4-5 servings. I would appreciate any information you can give me! Thank you. PS. Thank you for the vegan recipes. :) You’ve been making this vegan very, very happy! Thu, 2008-09-11 01:33 by anon. It could then be used in stir frys, stroganoff, sliced and eaten with ketchup, and used for sandwiches. The other reviewers have used italian seasonings, greek seasonings, mustard, among other variations. I hope you find it as interesting as I did! [note from Maki]: Thank you for pointing out the recipe - it looks great! I’ve edited the message to just include the link to the actual recipe, since the postpunkkitchen forum is not a closed one and I’d like to discourage pasting of entire recipes from other sites (not to mention pasting of entire recipes from this site to other sites if possible. :) Thanks ! This recipe looks great! I have not heard of kuzu powder before, will have to see if they carry it in our local asian market. Whenever I bake tofu, I do at least 2 blocks worth since it is relatively time/oven consuming but so delicious at the end! I’ll have to give this glazed version a try, thanks for posting! I've made this recipe many, many times in the past year or so since it was posted and I love it! In fact I'd say it's one of my favourites on justbento. If you have the ingredients then definitely make it!! It's also really great as a stuffing for mini peppers or pre cooked squash. EnjoyXX I promise you'll love it! !